It all began about a week ago when I wandered into the pillow section of one of the local department stores and saw this light blue beauty. It was love at first sight. I thought perhaps it was a display piece and so I sat on it, had a friend take a picture, and off we went. That night I dreamt of riding along the lake and into the clouds and over the moon. I had a popsicle in one hand and a balloon in the other. I went back to the shop a couple of days later and learned that it was in fact for sale. I left the store again. You see, I only have about a week and a half left in Geneva. Did it make sense to buy it? I could ship it wherever I went next. But would I be able to ride it on the streets of Kenya, India or Haiti? Yesterday was Navroz, the first day of spring, and the New Year. It was also late night Thursday, the only evening that shops are open until 9pm in Geneva. I had just left a function and while I was on the bus, I had this overwhelming urge to stop at the department store. It was on the way home. I hopped off 20 minutes before closing and went straight for the pillow section. It was still there. I took a look at it, it all seemed fine and it was mine within 5 minutes! I rode it home along the dark, streets and past the lakeside, but decided I would wait until the following day to ride it along the water. Since I had just come back from a formal event, I was in a dress, pretty boots and had a small evening purse with me. I was an interesting sight to the few that witnessed my jubilation. When I got home I realized that the bike was not going to fit in the elevator. Of course it wouldn’t. 2 people can barely fit inside the elevator without having to smell each other’s breath. So now, I had no choice but to carry her up five flights of spiraling staircases. I had no clue how to do this. I lifted my dress up a bit, swung the purse handle over my shoulder, bent my knees and lifted her. I made my way up the never ending stairs, pausing on each floor along the way. By the time I hit the top floor, I was sweating like I had just been in a bike marathon and definitely had pulled a muscle or two in my back. I found a nice spot for it by the balcony after having to re-arrange some furniture and sat there admiring it. While I was riding it home though, I noticed that the front wheel made some weird sound…clickety click. It was somewhat annoying to me and I needed to figure out what it was. So I asked a long, lost friend, who had also given me the push to buy the bike, despite my hesitations, if he was around to Skype, so he could tell me what the noise was. I have not seen him in about 20 years and nor had we spoken before he got the idea into my head. I just had this feeling that he knew about bikes. He was kind enough to take my call at 10:30pm, his local time. Well, we weren’t able to solve the mystery, but we did have a great catch up session. There is a bike store around the corner from my place and I decided to take it over this afternoon. I got to the shop and it was closed until 2pm. The second shop that I went to was also closed. Who closes shop at noon? We aren’t in Spain! And so I hopped back on and rode it to the department store where I bought her from. Along the way, something weird happened and the brake felt funny and all of a sudden, it snapped! I couldn’t stop! My legs quickly reacted though and I was able to place them down on the ground to stop myself from hitting a lady with a bag of g I got off and then some sort or groceries. And then a screw fell off. This was not good. I walked it the rest of the way. 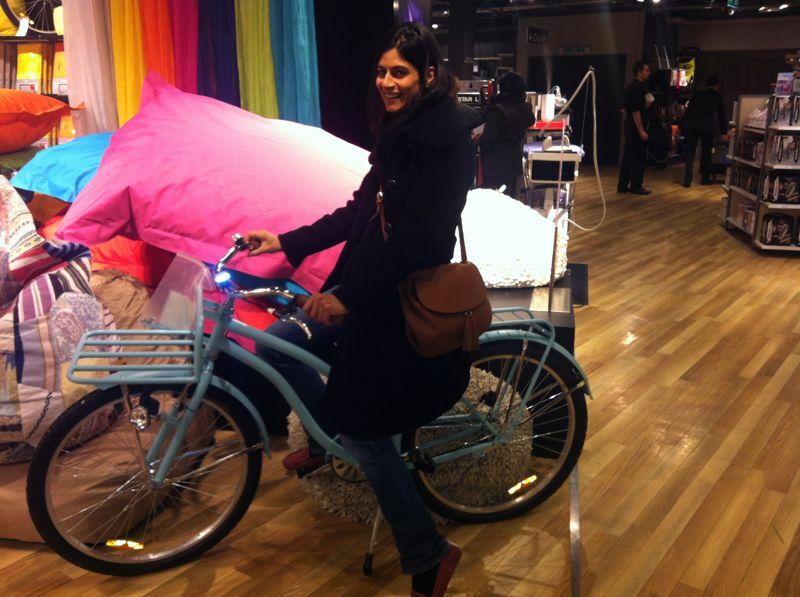 I got to the department store and the sales girl who sold me the bike was there. She didn’t speak English well and my French is…pretty much obsolete. So she called over a sales person who spoke English, somewhat. I explained the whole ordeal to him and he sort of understood but said he was going to call a colleague of his. And so this man, who somewhat resembled Sean Penn, arrived minutes later. He seemed to know all about bikes and put the brakes back together for me. Both men realized that the reflector lights were not working and so they fixed them and the bell, that was buggered too. They tightened a few screws and then told me there was not enough air in the bike. The whole time, people were walking by and smiling and admiring my blue beauty. A couple of passerbys wanted to know where they could find one. I was proud. One of the men felt that the seat was not leveled for my height and so he got to work. Julian arrived. He worked in the bike section on the first floor. They had called him down to inspect the bike. Julian was a young and energetic soul, but he needed to pull his pants up a bit. I went upstairs with him because apparently I had to buy a bike pump, since there was not air in both of the tires. Luckily, Julian was kind enough and told me to bring the bike to the back area where he would fill my tires up without me having to buy one. So, I left the bike with Julian and asked him what the clickety click was too because the men downstairs were not sure. I ran downstairs to the chocolate shop and bought some Easter chocolates for my 3 friends downstairs who were soooo kind and fixed my blue beauty for me. There was an exchange of happiness. I ran back up to see Julian and he asked me what had happened to the bike. I was not sure what he meant bu that until he pointed to two long, deep scratches. What the…! How did those get there? And then another long scratch at the back. I was super confused. After further investigation he realized that when the seat was adjusted it had been done in an incorrect manner and that is what caused the deep scratches. I felt sad and Julian told me it was bad. He said he would accompany me downstairs and we would sort it out. I knew the only other bike that they had sold this morning Julian had fallen in love with blue beauty too. He had asked me how much it was, if there were more. He wanted one too. He did not seem the type at all to be riding a light blue bike. He would definitely need to pull his pants up though if he decided to ride a bike. My 3 friends and Julian gathered around and Julian showed them the scratches. Alex, the only female threw her hand to her mouth in shock when she saw the scratches. You could tell that she felt terrible. The others did too. The manager came. Other shoppers surrounded us, making faces like they were looking at a dead body on the ground. There was a cloud of sadness above us all. Alex ran to the arts and crafts section and brought back paint! Okay, this was going too far now. And then someone else brought a permanent marker! Another manager was called and he said that only 2 bikes had been ordered and they couldn’t get another. Then all of a sudden all 4 em employees got onto their fancy shop phones, and began talking really fast in French. I heard ‘Madagascar’ and a bunch of other words that I could not translate. Alex told me that they would call the ‘Chief’ and get me a discount if I wanted to keep her still. Did I want to keep a bike that had failed on me and that was now damaged? I felt that we had started off on the wrong foot. It was almost as though she was just not meant for me. Julian on the other hand was still admiring her. One of the men got off his phone and told me he would get a new one by the 26th. Everyone sighed in relief. I was happy with the result. Julian decided he wanted to keep this blue beauty and I was happy for him. I know that I could have probably got that bike for half the price and the opportunity to enjoy it for the next few days before packing it up. But I could see the happiness in Julian’s eyes. And I know how I am. I hate scratches on new things, even if I make them myself later on. It bothers me when magazine covers are slightly bent on the news stands. I don’t like it when handbags have scuffs on them even before I have had the chance to take them home. The decision to wait was a good one. And so my blue beauty has gone to someone else and I shall wait for another. I do hope that on the 26th when I go back to the store, that it is in fact there! Maybe Julian and I can ride our blue bikes together. And so now I wait. It was an eventful afternoon, but a nice one in the end. The blue beauty brought smiles to many faces. Oh and by the way, in the end…no one was able to figure out clickety click sound was!